Because it promises throughput as much as 10 times greater than that available with current Wi-Fi® standards, the forthcoming IEEE 802.11n standard is generating tremendous interest among users of wireless LAN (WLAN) products. 802.11n throughput rivals that of Ethernet, and so availability of 802.11n may cause some organizations to use WLANs as the primary means of network access for typical computer users. Although the 802.11n standard will not be finalized and ratified until 2009, it is easy to find laptops, home routers, and other products with radios that are based on a draft of the standard. The Wi-Fi Alliance, an industry association, is performing product interoperability testing and certification based on the draft standard. Should makers of medical devices be racing to add 802.11n to their devices? Probably not. 802.11n certainly offers benefits to medical devices, even though these devices don’t need a major throughput boost. The non-throughput benefits of 802.11n, such as improved predictability of coverage and slightly greater range, are attractive to all mobile devices that require a reliable WLAN connection in an environment that presents connectivity challenges, such as a hospital. The good news is that, when the WLAN infrastructure supports 802.11n, all Wi-Fi client devices, including those without 802.11n radios, realize these non-throughput benefits. In other words, adding 802.11n to a hospital infrastructure helps medical devices and all other Wi-Fi devices obtain and maintain more reliable connections. The buzz about 802.11n is, of course, the greatly increased throughput that it offers. This throughput is the result of a set of enhancements that includes double-wide transmission channels and multiple input, multiple output (MIMO) technology. To gain increased throughput, you need 802.11n not only in your network infrastructure but on every client device. Exploiting MIMO and other 802.11n capabilities in a medical device, especially a small medical device, may prove challenging. One notable challenge is squeezing at least three antennas into a small device and spacing the antennas far enough apart. When 802.11n is deployed initially in hospitals, there will be few 802.11n client devices and many “legacy” devices that support 802.11a/b/g. 802.11n backward compatibility with legacy standards comes at a price: reduced throughput for all devices, including those with 802.11n radios. As bandwidth requirements increase, so too will pressure to ensure that all mobile devices support, but not necessarily exploit, 802.11n. Medical device makers then will move to put 802.11n radios – likely those that support the final, ratified standard – in their devices but may not redesign those devices to exploit 802.11n capabilities such as MIMO. In short, while the use of 802.11n radios in medical devices is an inevitability, medical device makers don’t need to race to put 802.11n radios in their devices. By waiting until the “dust settles”, medical device makers avoid taking risks with early 802.11n radio chips that may have a limited lifespan or require firmware or even hardware upgrades to support the final, ratified standard. Fortunately, medical device makers and users can attain key benefits of 802.11n with both pre-standard and post-standard 802.11n implementations in the WLAN infrastructure. 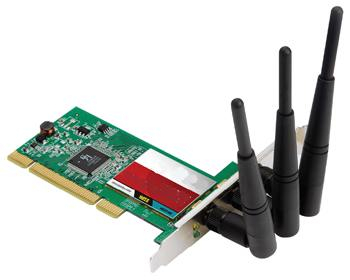 Pictured above is an Edimax PCI 802.11n radio card for a desktop PC. Note the multiple antennas for MIMO. UPDATE: You can read a couple new (since this post) white papers on 802.11n here. Chris Bolinger is co-founder and VP of Business Development at Summit Data Communications, Inc. Prior to Summit, Bolinger was Manager of Partner Marketing and Software Product Manager in the WLAN unit of Cisco Systems, Inc. He earned a B.S. in Computer Science at the University of Akron and an MBA at George Mason University. I am not sure I agree that 802.11n will benefit medical devices as much as 802.11a. Certainly, the bandwidth is not needed, especially for embedded point of care devices. And, the potential compromise in power consumption to support MIMO and dual channel communications, let alone the need for three antennas, may be too much for battery powered devices to accomodate until such time as low power n chipsets are available. Hospitals are currently migrating from 802.11b or b/g to 802.11a,b,g at a substantial cost. Most are installing networks to support VOIP which improves the reliability and coverage of the infrastructure. The incremental value of n when capacity is not the issue does not seem to me to be as compelling as the migration from b/g to a. More importantly, hospital infrastructure robustness and stability, notably with CISCO thin AP deployments, are more critical to the success of ISM standards based adoption by medical device manaufacturers. I too have mixed feelings about 802.11n. I think diagnostic imaging modality vendors who make things like portable x-rays and ultrasound would love to have the bandwidth. But few devices could benefit from the bandwidth even if it was there. Chris does not seem to suggest that 802.11n be incorporated into medical devices, at least in the near term. And one would not want to run double-wide channels in 2.4GHz (there’s not enough non-overlapping channels as it is). Since the market’s largest wireless LAN vendor doesn’t have much of an upgrade path to 802.11n, I doubt there will be much demand in hospitals for some time. To my knowledge, the first hospital with an 802.11n network is a Meru network installed at Wake Forest and announced in January ’08. From what I’m hearing though, at someday it will be hard to buy silicon without 802.11n. At that point we arrive at Chris’ vision of an n capable radio associating with 802.11a/b/g/n infrastructure. The 802.11n standard has two top-level mandates : Achieve higher data rates and retain backward compatibility with legacy 802.11a/b/g devices. The significance of requiring backward compatibility shouldnâ€™t be taken lightly since it complicates the development process exponentially. Yet the 802.11n group has come up with a soon-to-be-ratified standard that meets both objectives. 802.11n uses MIMO smart antenna technology, which is by far the most visible improvement being leveraged by 802.11n. As healthcare is one of the most worst multi-path environments, MIMO actually leverages multi-path to improve performance characteristics. Most consumers chase the bandwidth curve, but it is questioned IF medical devices using 802.11n actually need this bandwidth improvement. The option of improving multi-path is a very positive move, however is this worth changing out all 802.11a/b/g AP(s) for this at this point? Certainly in those bandwidth sensitive applications like video and large file transfers 802.11n does make sense somewhat. In the actual day to day need of medical devices it is questioned in 2008 if it does make sense due to low bandwidth transmission requirements of say patient monitors, infusion pumps, and even BCMA (bar code meds administration) applications. A basic description of MIMO follows. MIMO systems divide a data stream into multiple unique streams, each of which is modulated and transmitted through a different radio-antenna chain at the same time in the same frequency channel. A revolutionary technique that reverses 100 years of thinking about how radio signals are transmitted, MIMO leverages environmental structures and takes advantage of multipath signal reflections (challenges to healthcare environments) to actually improve radio transmission performance. Through the use of multipath, each MIMO receive antenna-radio chain is a linear combination of the multiple transmitted data streams. The data streams are separated at the receiver using MIMO algorithms that rely on estimates of all channels between each transmitter and each receiver. Each multipath route can then be treated as a separate channel creating multiple â€œvirtual wiresâ€ over which to transmit signals. MIMO employs multiple, spatially separated antennas to take advantage of these â€œvirtual wiresâ€ and transfer more data. In addition to multiplying throughput, range is increased because of an antenna diversity advantage, since each receive antenna has a measurement of each transmitted data stream. With MIMO, the maximum data rate per channel grows linearly with the number of different data streams that are transmitted in the same channel. More on 802.11nâ€™s improved technology: 802.11a/g already uses OFDM (Orthogonal Frequency-Division Multiplexing) to achieve data rates of 54 Mbps. 802.11n OFDM technology builds on 802.11a/g OFDM modulation by creating support for multiple channels (MIMO), allowing more bandwidth per channel, and higher code rates. This brings the maximum data rate of a single 802.11n OFDM channel to 65 Mbps. MIMO antenna systems: The 802.11n standard allows up to 4 MIMO transmit/receive antenna pairings. 802.11n OFDM has a maximum data rate of 65 Mbps, multiplying that by the 4 MIMO antenna channels raises the data rate to 260 Mbps, which is a significant improvement when compared to 54 Mbps. 40 MHz channels: To further improve data rates, 802.11n allows the use of 40 MHz channels-twice the existing 20MHz channels used by 802.11a/b/g-which effectively doubles the data rate to over 500 Mbps. 40 MHz channel size is also the most controversial tenet of the new standard, having the potential to disrupt existing 802.11a/b/g networks due to co-channel interference. Aggregation: Aggregation is an important feature developed to overcome shortcomings of having to be backward compatible with 802.11a/b/g networks. It improves mixed-mode performance and efficiency by bundling several frames together that are destined for 802.11n devices, while still being able to transmit single data frames to legacy devices. RIFS (Reduced Inter-Frame Spacing): RIFS is a required 802.11n feature that also improves performance by reducing the amount of dead time required between OFDM transmissions. It should be noted that this feature is restricted to greenfield deployments. With pre-release equipment already for sale and claims of equipment being firmware upgradeable to the ratified 802.11n standard, is it time to switch? What does this mean to businesses that may want to start using 802.11n equipment? Consumer interest: 802.11n promises many things, greater bandwidth, better range, efficiency and reliability. These promises are starting to be tested as pre-release equipment is being integrated into many households. The general consensus is noticeable improvement, especially when considering coverage area, throughput, and reliability. There is also a movement to eliminate mixed mode networks as soon as possible to take full advantage of 802.11n technology. Enterprise interest: Enterprise use of 802.11n will take longer to integrate because IT departments have to be more concerned about everything working all the time and being cost effective. The introduction of 802.11n equipment by the major wireless networking houses has given the standard an unequivocal stamp of approval, even without final ratification. Network designers and administrators are already looking at several unique uses for 802.11n equipment. With data rates exceeding some wired Ethernet networks, using 802.11n equipment for a backbone link thatâ€™s difficult to cable may now become a consideration. Increased bandwidth and larger coverage area per device may make it economically feasible to unwire the office or install a wireless network in the new addition. 802.11n is indeed a significant improvement, just like 802.11g when compared to 802.11b. All the theoretical data looks good, but with any new technology there is a learning curve. 802.11n technology is complicated, which means problems are likely to be complicated as well. Businesses alike will have to decide where along the accumulative learning timeline they feel most comfortable about moving to 802.11n. If you want more information on 802.11n and medical devices, please visit the Documentation section of the Summit Web site — http://www.summitdatacom.com — and download the white paper entitled “The Value of 802.11n for Medical Devices”. Chris, thanks for the white paper pointer. A good overview of the features, strenghts, weaknesses and challenges for those considering 802.11n standard. A must read.